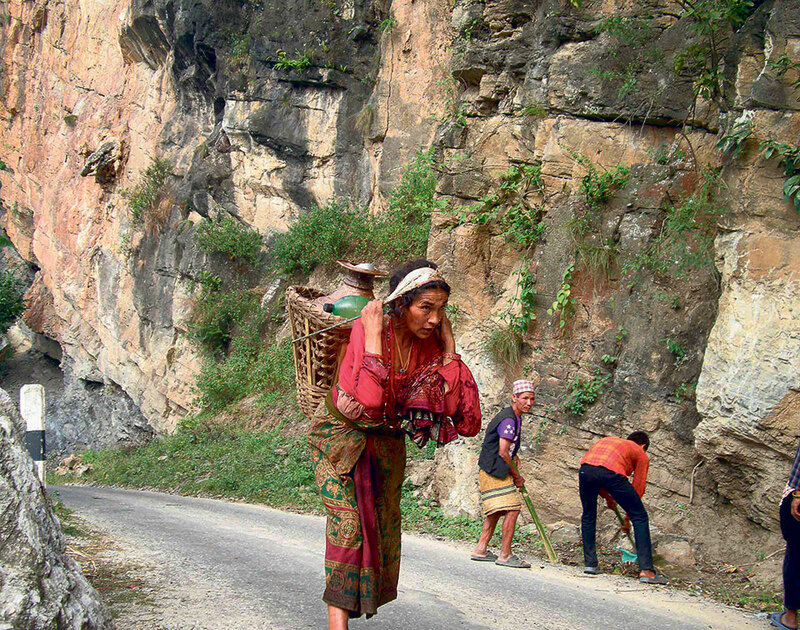 Woman carrying water in her basket in Tuwachung Municipality of Khotang in this recent picture. KHOTANG, Feb 11: Imagine life without water. With water sources fast drying up, the question of survival has left some locals in Khotang worried. Several villages of Khotang in Tuwachung municipality and other area are suffering from water crisis. The shortage is so much that they are now forced to think of an alternative or migrate to other areas from there. “After water source from Paneri Khola dried due to the earthquake of 2015, we have been left helpless. Besides that other sources of drinking have already dried over the last decade,” said Ganesh Rai, a local of Tuwachung Municipality-1. “There are some taps around the municipality around, but they do not supply water,” he added. Owing to water crisis, both humans and cattle are now facing crisis in many village of Khotang. They do not have water for drinking, taking bath, washing clothes and cleaning house. “Crisis of water is so much that we don’t have been even water to drink, to bathe new mothers and babies. We are living a miserable life,” Rai said. He further said that residents in the area have been going to other villages for water. But sometimes, they do not get water even there. During festivals or other occasions, such problems even escalate, he said. “We are people who depend on agriculture. But in lack of water, you can imagine the condition that we are going through. We have started cultivating our field in lack of rain. Rain alone is our hope but that depends on climate,” Rai stated adding that this season their luck has not been with them. Some locals blame the scarcity of rain on climate change. However, they admit that water crisis is not a new thing in Khotang. According to Rai, there area has always been dry and therefore its resident always face shortage of water and rain. But this year, it has been the worst. The residents came to know about the concept of climate change through some representatives of NGOs. Rai has even taken part in some of the surveys that tried to analyze impact of climate change. Reflecting back on those findings, the shares that the crisis they are facing is a directly a result of the climate change. “We don’t have rainfall on time. Even the seasons are not on time. Presently we are indeed living in extreme weather conditions. We cannot predict rain these days. In the recent years, we have not received rain even during the rainy season. Such unprecedented seasonal change has affected our crops,” he stated. Well water tank are now not limited to major urban areas. They now reach to semi urban areas like Khotang district headquarters. But the cost is so high that only a few of the residents can afford to buy. Defending the steep charges that the tankers carry water to the area from far-flung areas and therefore the charges are justified. “For the rich people, it is still okay. They can afford to buy water. But in most rural villages, there are very poor people. They cannot buy water. Moreover water tankers also do not come to these remote places unless reserved by the locals,” Rai informed. Water tanks fill water from rivers within or outside the district and transport to their clients. Though the district administration has fixed rates, they seldom follow. Nor do the recipients bother about the government rates, as there is scarcity of water tankers. “Even though they are not allowed to charge steep prices, we pay steep prices. Because there is shortage of water supply and water tankers in the area. We are less water tankers than we need and it has created a monopoly that they are exploiting,” he said. Locals have urged the government to address the situation by preparing proper solutions. Deepening water crisis has taken toll in their health, they say. “We are living extremely miserable life here. We do not know the solution to resolve the crisis. As thousands of people are suffering because of this crisis we want the government to take this matter seriously,” Rai said.